Image above: courtesy, Gurumustuk Singh. Why Do We Beat The Nagaara At The Conclusion of a Gurdwara Service? This is the FOURTEENTH in our series of questions and answers where we seek your active participation. 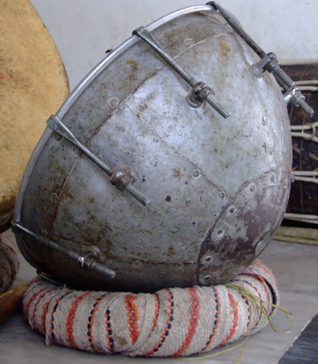 In old and historical gurdwaras in particular, but in many of the newer ones as well, there is a tradtion to beat the nagaara (battle-drum of yore) at the conclusion of the ardaas, and complementing the jaikaras that mark the end of the service. What is the source of this tradition? 1: Baldev Singh (Bradford, United Kingdom), March 15, 2012, 2:01 PM. We have always had to contend with enemies that outnumbered us, and had to employ various methods to keep our morale up, always against heavy odds. Our techniques have worked for us: we have always triumphed against our enemies ultimately. One of those techniques used was the thunder of the nagaara. It is part and parcel of our DNA and an important component of our chardi kalaa! Hence, it's booming thunder goes hand-in-hand with the remembrance of our sacrifices, our triumphs and our challenges, that we recite every time we do ardaas! The total effect is awesome! It pumps up the adrenaline and gets the juices flowing each time you go to the gurdwara! 2: Sangat Singh (Kuala Lumpur, Malaysia), March 15, 2012, 4:34 PM. As a child, the first time I saw and heard the beat of a nagaara was in "Wuddha Gurdwara" in Lyallpur. My burning ambition was to beat the drum at the start of the ardaas and then to punctuate it at every "Bolo ji Waheguru!" The fierce kirpan-adorned drum-master Bhai ji wouldn't let me anywhere near it, thus nipping my career as a nagaara drummer in the bud. The history of the Sikh nagaara - eventually named "Ranjit Nagaara" - The Drum of Victory - started with Guru Hargobind as a symbol of royalty. The thunderous roll of the Ranjit Nagara during Guru Gobind Singh's time became a normal practice. 3: Ajit Singh Batra (Pennsville, New Jersey, U.S.A..), March 22, 2012, 7:04 PM. My suggestion is that the beat of Nagaara needs to be made not during ardaas but after the vaak has been read. Conclusion of the gurdwara service entails the reading of the vaak. After this, with a jaikara, the nagaara should be beaten. From this point onward, while parshaad is being distributed, matters relating to community or management issues can be addressed. Comment on "Why Do We Beat The Nagaara At The Conclusion of a Gurdwara Service?